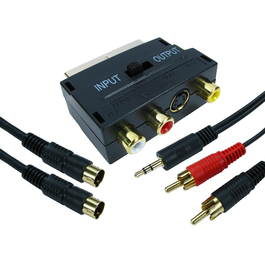 The SCART connection kit consists of a SCART adapter with composite video, S-VHS, left and right audio and input/output switch. The cables included in the kit are a S-VHS cable and a 3.5mm stereo to twin RCA cable. Gold flashed contacts for a higher quality finish while providing anti-corrosive properties.